Thus far I am enjoying the ease of quilting a block vs. a whole quilt on my domestic machine. Of course the trick will be how well will it go together. Key is to make sure each block is the same size! I am just tickled pink orange with the quilted rays on this unique and awesome star block. If it has a name I don't know what it is but, if you do please leave a note in comments. For those reading about the star blocks for the first time they were made by the members of the Charlotte Modern Quilt Guild and I happened to be the lucky person to go home with them. I love this block too with it's cross-hatched center! While quilting these blocks I counted stitches so I wouldn't have to draw each quilt design. This saved a lot of time. I learned that counting stitches on the bias vs. straight edge didn't necessarily end up having the same amount of spacing. 12 stitches on a straight edge was 3/4 inches but not so when on a bias line. Here's another illuminating star that makes me happy! The pink looks so nice with the gray polka dot frame. The backing on each of these blocks is 1 inch wider than the block all around. They will be double folded toward the front of each block after being sewn together with backsides facing each other. All other remaining blocks are sandwiched and pinned ready to be quilted. Though no finishes I feel as though I was productive this past weekend. Batting for one of the blocks had a tiny piece missing. My fix it was cut a piece to fill the sliver and glue it and heat press it so it stays in place. Glue has become quite essential lately for my sewing and quilting needs. Binding before stitching. It saves fingers from being pricked. In tight places such as rag dolls and clothes. Fun And Done sashing. Will work great keeping the sashing pressed in place until it is sewn. Following "Sew With Sass's" tutorial for making the St. Louis 16 Patch I made this block using existing stash. I had a bit of time wrapped up looking for something where the fabrics were compatible. 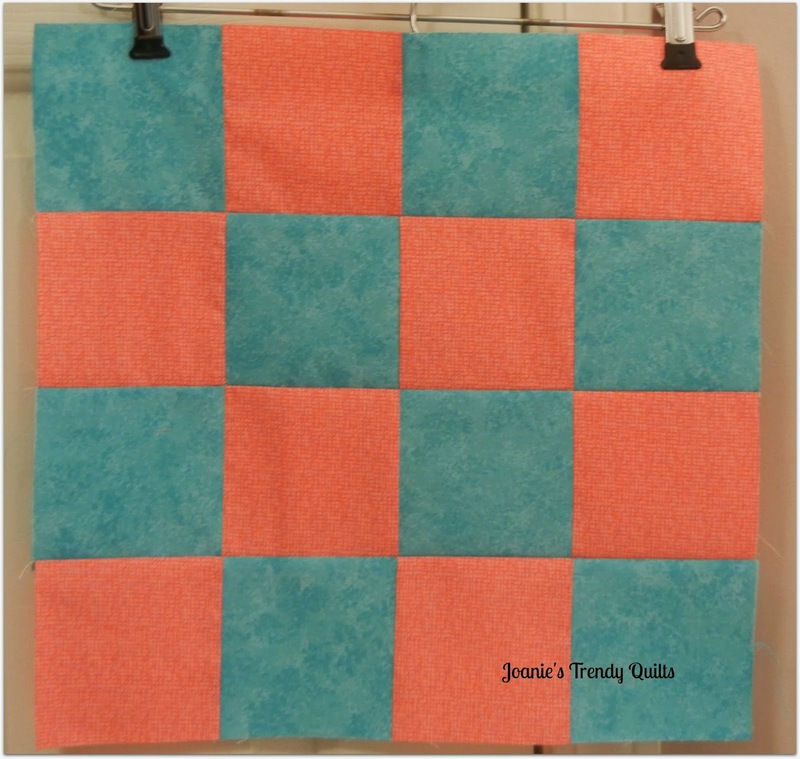 Sew with Sass's uses fat quarters that will make two complete blocks. I made the first one on the fly to take as a swap block Thursday night to the guild meeting. A couple of days later the second block was completed. Now this block needs a quilt - right? Overall I was believing my stash was banking on boring and being antiquish. So with my Rainbow Selector I coordinated some pairs for making more St. Louis 16 patches. I was quite elated to make that happen. In all honesty I wouldn't have paired most of these together. I stress over combining colors but this little tool made it easier. Earlier this afternoon I had been flipping through some quilting books and used Sticky Notes on pages with quilts that caught my eye and noted what I like most about each. Most often it was colors over design. I am grateful for Cynthia Brunz Designs, aka as "Quilting is more fun that Housework" who is my inspiration to take time out to learn how to put fabric and colors together from my stash as she does. She creates the most wonderful quilts that are well color coordinated from her stash. Amazing!! If you haven't seen them I have completed another tote bag (WooHoo!) and a set of 20" Raggedy Ann and Andy dolls. They can be seen in My Etsy Shop. I hope you have time to visit it. It is a new adventure for me opening up shop! Back to sewing, quilting and creating! I hope you have a great week. It will be a busy one for me! Gasp!! Your blocks are amazing! The quilting is really making the blocks! That is going to be a beautiful quilt when it is finished. Can't wait to see it! I'm also happy to see you looking for those hidden treasures in your stash. I am glad to hear I have inspired you. Thanks so much for the kind words and feature! Looking at your fabrics, I know there are some beauties in there! Never thought about letting the print be the background and the white being dominant. That's a great idea. enJOYed your post. 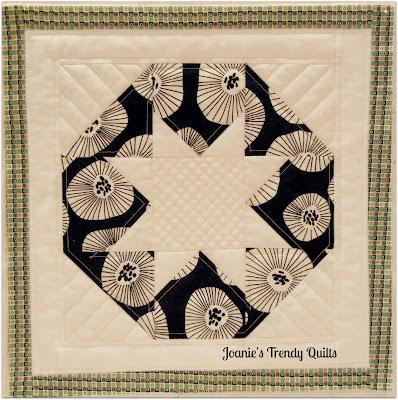 Joanie just love those quilt as you go stars! And your 16 patch is very pretty too! The second block I just love. Great idea. Your QAYG blocks are stunning! Kevin my fat fingers on my IPad inadvertently removed your message! Briefly I saw it and I am heartbroken that I can't retrieve your message! Thanks so much for visiting and your leaving your sweet comments! These stars are so much fun, and what fantastic contrast! 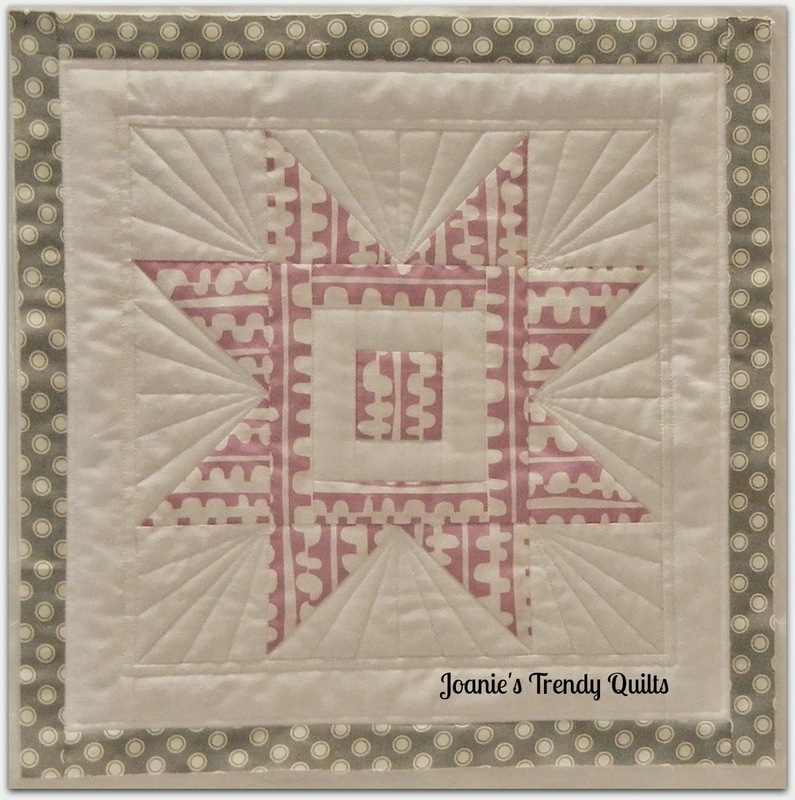 Beautiful blocks and perfect quilting! 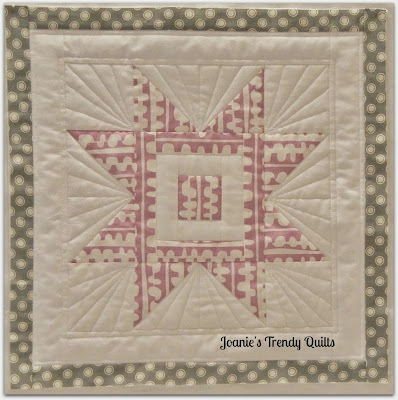 Love these blocks Joanie! I think the first is my favorite. Love those tiny points and the quilting is perfect. What fun blocks! 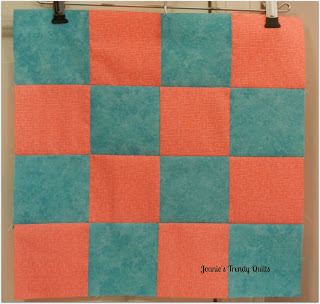 I love the quilting you've done so far, I will have to try a quilt like this sometime. Those black and white stars are stunning. This will be beautiful. Those blocks are stunning! Absoluetly gorgeous!!! Beautiful blocks Joanie and I'm sure you will like the QAYG method. Have fun! Thanks for sharing. 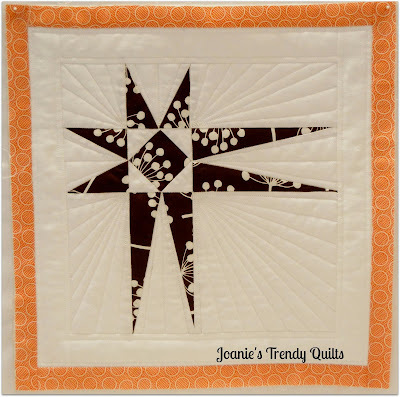 Such great prints that you're using for your qayg star blocks! It's going to be a gorgeous quilt! your QAYG blocks are gorgeous! 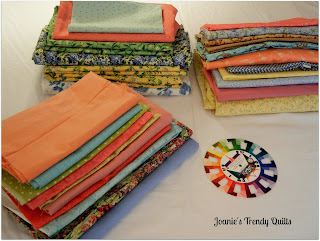 I love how that method makes it easier to really show different kinds of quilting in each space.